You had the most amazing dream last night. It spoke to your highest aspiration-your most secret wish-and presented a vision of a future that was right for you. But now, in the cold light of day, that inspiring dream is gone forever-or is it? According to Dr. Stephen Aizenstat, a psychotherapist, university professor, and dream specialist, dreams are not just phantoms that pass in the night, but a present living reality that you can engage with and learn from in your daily life. 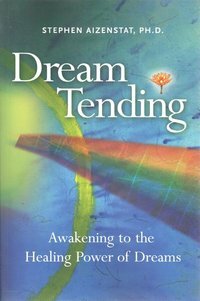 In Dream Tending, Dr. Aizenstat shows how to access the power of your dreams to transform nightmare figures into profound and helpful mentors; bring fresh warmth and intimacy into your relationships; overcome obsessions, compulsions, and addictions; engage healing forces of your dreams through imaginary "medicines"; re-imagine your career and cope with difficulties in the workplace; discover the potential of your untapped creativity; and see the world around you from a new and dynamic perspective.